When we started OpenCorporates it was to solve a real need that we and a number of other people in the open data community had: whether it’s Government spending, subsidy info or court cases, we needed a database of corporate entities to match against, and not just for one country either. But we knew from the first that we didn’t want this to be some heavily funded monolithic project that threw money at the project in order to create a walled garden of new URIs unrelated to existing identifiers. It’s also why we wanted to work with existing projects like OpenKvK, rather than trying to replace them. So the question was, how do we make this scale, and at the same time do the right thing – that is work with a variety of different people using different solutions and different programming languages. The answer to both, it turns out, was to use open data, and the excellent ScraperWiki. How does it work? Well, the basics we need in order to create a company record at OpenCorporates is the company number, the jurisdiction and the company’s name. (If there’s a status field — e.g. dissolved/active — company type or url for more data, that’s a bonus). So, all you need to do is write a scraper for a country we haven’t got data for, name the fields in a standard way (CompanyName, CompanyNumber, Status, EntityType, RegistryUrl, if the url of the company page can’t be worked out from the company number), and bingo, we can pull it into OpenCorporates, with just a couple of lines of code. Let’s have a look at one we did earlier: the Isle of Man (there’s also one for Gibraltar, Ireland, and in the US, the District of Columbia). 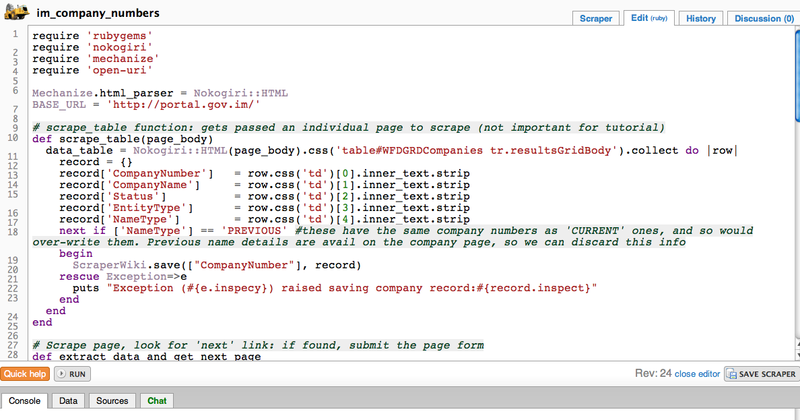 It’s written in Ruby, because that’s what we at OpenCorporates code in, but ScraperWiki allows you to write scrapers in Python or php too, and the important thing here is the data, not the language used to produce it. The Isle of Man company registry website is a .Net system which uses all sorts of hidden fields and other nonsense in the forms and navigation. This is a normally bit of a pain, but because you can use the Ruby Mechanize library to submit forms found on the pages (there’s even a tutorial scraper which shows how to do it), it becomes fairly straightforward. The code itself should be fairly readable to anyone familiar with Ruby or Python, but essentially it tackles the problem by doing multiple searches for companies beginning with two letters, starting with ‘aa’ then ‘ab’ and so on, and for each letter pair iterating through each page of results in turn, which in turn is scraped to extract the data, using the standardised headings to save them in. That’s it. In the space of a couple of hours not only have we liberated the data, but both the code and the data are there for anyone else to use too, as well as being imported in OpenCorporates. However, that’s not all. In order to kickstart the effort OpenCorporates (technically Chrinon Ltd, the micro start-up that’s behind OpenCorporates) is offering a bounty for new jurisdictions opened up. It’s not huge (we’re a micro-startup remember): £100 for any jurisdiction that hasn’t been done yet, £250 for those territories we want to import sooner rather than later (Australia, France, Spain), and £500 for Delaware (there’s a captcha there, so not sure it’s even possible), and there’s an initial cap of £2500 on the bounty pot (details at the bottom of this post). Find a country/company registry that you fancy opening up the data for (here are a couple of lists of registries). Make sure it’s from the official registry, and not a commercial reseller. Check too that no-one has already written one, or is in the middle of writing one, by checking the scrapers tagged with opencorporates (be nice, and respect other people’s attempts, but feel free to start one if it looks as if someone’s given up on a scraper). All clear? Go ahead and start a new scraper (useful tutorials here). Call it something like trial_fr_company_numbers (until it’s done and been OK’d) and get coding, using the headings detailed above for the CompanyNumber, CompanyName etc. When it’s done, and it’s churning away pulling in data, email us info@opencorporates.com, and assuming it’s OK, we’ll pay you by Paypal, or by bank transfer (you’ll need to give us an invoice in that case). If it’s not we’ll add comments to the scraper. 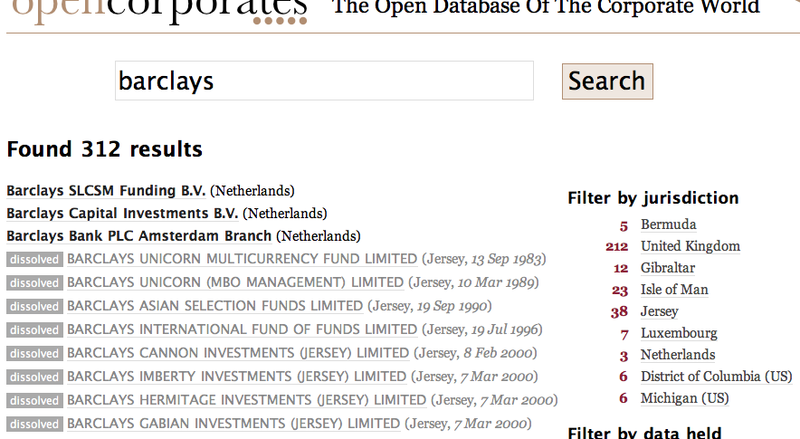 Any questions, email us at info@opencorporates.com, and happy scraping.